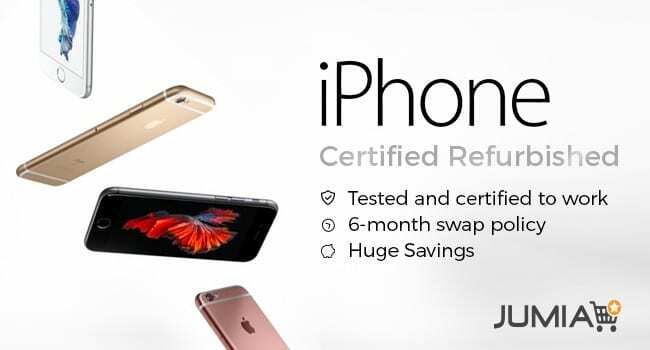 You can now get certified refurbished Apple iPhone in Nigeria as JUMIA Nigeria launches a new offer of reconditioned Apple devices. A wide selection of certified refurbished iPhones from Europe is available on the website, starting at N49,900. The largest e-tailer in Nigeria continues the crusade for the revolution of shopping habits. By moving precursor on the online market for reconditioned mobile technology, JUMIA Nigeria confirms its determination to bring its customers the world’s best brands at the best prices. Refurbished Products underwent the brand’s stringent refurbishment process and had been tested and certified to meet international quality standards. This is different from COPY. Every refurbished product goes through a full functionality testing and any defective modules identified are replaced. The product then undergoes a through a thorough cleaning process and inspection, before it is repackaged with appropriate manuals, cables and new boxes. For this new offering, JUMIA joined forces with a European specialist of electronic reconditioning by signing an exclusive partnership for Nigeria. All refurbished products listed, bear the mention “Origin EU”, asserting their origin and quality. Refurbished products come mainly from surplus, returns from conventional distributors; products returned to operators as part of an exchange program, etc. They are fully tested, cleaned, checked and factory configured before being repacked in plain packaging with new accessories, essential for proper operation. Restored units are fully operational as new. Refurbished high tech devices now account for about 16% of online sales of tablets and phones in Europe. Reconditioned as opposed to second-hand (JUMIA does not sell second hand), eliminate the risk of functional defects with the bonus of a 6-month warranty offered by JUMIA. This new feat by JUMIA comes as a golden opportunity for e-shoppers who can now purchase last generation, almost new devices at exciting prices. Have no fears; they are not your regular London-used devices. These iPhones have been thoroughly tested & certified to work. They have no functionality issues. This is perfect if you are on a budget or need to replace your phone. It will also be a great gift idea this holiday. They also have a six months swap policy in place. This way we’ve got your back covered even after you have bought the iPhones. This is an opportunity not to miss under any circumstances. Hurry while your favourite specs and colours are in stock! Jumia Nigeria |from N13,995 CLICK HERE!